Porto, Portugal stole our hearts! Portugal’s second city is picture-perfect and it’s a photographer’s dream. Neil expertly captured its pretty palette of colours and graceful architecture during our 4 days in Porto. He had been before, creating content for Ryanair, and he couldn’t wait to explore it with me. He predicted correctly that I’d love Porto and that I might even prefer it to Lisbon. Built on the steep slopes of the winding, Douro river, it’s great exercise exploring it on foot but there are funiculars and lifts for extra help. Its enviable position offers stunning viewpoints overlooking the red-tiled roofs of the old buildings, tumbling down narrow streets to the riverside. I think because of this, and the fact that Porto feels so relaxed and chilled out, it beats Lisbon’s larger and busier vibe. It’s definitely worth your while to spend at least 4 days in Porto. That way you can relax, soak in the chilled atmosphere and explore its maze of cobbled streets. We tagged our 4 days in Porto onto the end of our favourite, and by now, regular house sit in Portugal. We got the bus to Lisbon and headed for Oriente Train Station, a major transport hub for the city, which is conveniently connected to the huge shopping mall, Centro Vasco da Gama to grab a bite before a trip. Train travel is definitely our favourite way of getting around, if we can manage it, so we were delighted with the opportunity to see the Portuguese countryside on our way up North. It only cost €15 each (if you book early you get the best discounts) and took just over two and a half hours. It absolutely beats the dead zone of airport security and boarding gate queues! As we approached Porto, the train crossed the Ponte de São João bridge giving us a fantastic view down the river towards the city, bathed in golden sunshine. We arrived at the Airbnb apartment after a short 15-minute walk from the Metro Station and our friendly host, Inez, met us at the door. It turned out that Inez and two others only use the place as a studio for their design company so we’d be the only ones sleeping there. They had the fridge stocked with beer and told us to help ourselves! We ended up having the entire apartment to ourselves for the 4 days as they weren’t around. We settled in, got the camera gear organised and then went for a walk towards the river. 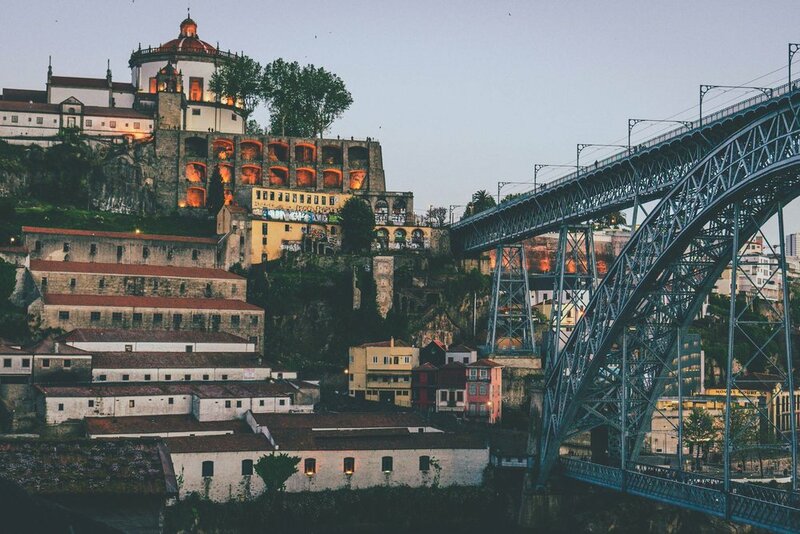 We found ourselves on a steep descent, down winding stairs with one of the best views of the iconic Luís I Bridge. The ornate ironworks of the huge bridge, framed by the lovely old buildings rising either side of the steps is the best 'first glimpse' of Porto you can get. Just head for Muralha Fernandina, a huge medieval fortress overlooking the river and go straight down from there. Keep the easier ride on the Guindais Funicular for your trip back up. We walked along the waterfront of the Ribeira, the tourist hotspot of the city, and found Wine Quay Bar to indulge in some wine and tapas. It's popular for good reason as their outdoor seating is right by the wall above the quays. Tremendous views of the bridge and across to Vila Nove de Gaia on the other side, paired with gorgeous wine and excellent tapas, might mean it’s a little pricier but it’s so worth it! We sat here for a good while planning our days ahead and trying new Portuguese wines and cheese. FC Porto had just won Portugal’s Primeira Liga so the streets were filled with happy soccer fans screaming “PORTOOOOOOO!” and the blue and white team colours were flying everywhere. We slowly walked back towards our Airbnb and found a huge queue outside a little corner cafe at Jardim de São Lázaro (the city’s oldest park). Rather than join the queue of football fans outside that night, we took note of it and planned a return visit for when it was less busy. Instead we headed for a couple of bars across the road which were buzzing with students and locals all enjoying the incredibly cheap beer and lively atmosphere. This became a regular 'end-of-the-night' ritual for us and it was great to find a local hang out for a late-night drink, that felt somewhat off the beaten path. Our next morning was kind of lazy, given our shenanigans til the wee hours the night before. We decided the best thing for us would be pancakes so we set off looking for O Diplomata. To our disappointment, it was extremely busy with a massive queue down the street outside. It was going to be an hour-long wait so we ditched that plan and let our feet take us to where ever they would. Luckily we stumbled upon Cafe Progresso, the oldest cafe in Porto and tucked into possibly equally as delicious pancakes and coffee in there. Definitely drop in here for a bite or a bica when you get to Porto. It's beautiful inside and out. We ambled afterwards, to Praca de Lisboa, a lovely little park for a snooze in the sun, which I did happily, while Neil took pictures of the nearby Clerigos Church. We made our way back down to the river via Miradouro Vitória. It's probably one of the finest viewpoints for perfect Instagram shots of the city. There's nothing there but run down buildings and graffiti but there's plenty of space to set up a tripod or just sit on the wall and admire the view. If you follow the steps down from here towards the river it's a nice walk with some good street art and lovely little alleys and old buildings. We stopped for a snack in Xico Tico, a cafe on a back street not far from the waterfront, rather than picking one of the touristy places on the tram line which looked overpriced and not so inspiring. This little place is friendly and cheap and does Brazilian snacks like Empadinha and Esfiha. We didn't get to have the caipirinhas but they’re supposed to be the best! We walked across the bridge to explore Vila Nova de Gaia and take in the view back across the river. This view is probably the most familiar picture of Porto, and even if it’s overcast, it’s still a stunning sight. It’s best enjoyed with a glass of port where all the port is made! After a tasting session in Porto Cruz, we went to the outdoor seating at Sandeman, next door, and had a glass looking out over the river. It’s very touristy here in the high season so, needless to say, we didn't linger too long and headed back over the bridge to find some dinner. On our way up from the riverfront along Rua de Augusto Rosa, we saw an ad for chips (fries) which I couldn't resist. It turned out to be part of a food court called Tasty District, kind of like a very small version of the Time Out market in Lisbon, with craft beers, wine and a variety of food options. It was a really cool place and we stayed for live Fado, delicious pizza, Douro wine and cheese. The music was utterly spine-tingling and the finest Fado musicians we've heard so far. It was a perfect ending to our day of exploration. The next morning we couldn’t believe we hadn't had any pasteis de nata yet and we needed to rectify that immediately! We headed to the shopping district around Rua de Santa Catarina, where our pasteis de nata hunt lead us to Fabrica da Nata. We stood at the counter and indulged in these gorgeous custard pastries fresh from the oven, washed down with a strong bica (espresso). This place might actually rival our favourites in Lisbon and Belem! I suppose we'll just have to go back and test that theory on another trip! Fueled up with sugar and caffeine our feet decided the day. We literally wandered with no plan and it was lovely. Porto, like Lisbon, is perfect for exploring on foot and taking random turns down narrow, cobbled lanes. On the way we stopped to admire the Chapel of Souls with its azulejo-covered facade but avoided the queue to get inside. It’s a very busy corner with lots of selfie sticks but you can’t help stop and be in awe of the beauty of the tiles. One of our greatest discoveries on this route around Porto was a little corner shop/deli called Casa Lourenco that had an amazing array of wine, port, cheese and meat. We were awestruck at the delicious display and thought to ourselves, "This calls for a picnic!". We selected a little baby port each and some locally produced fig and blueberry jam to go with our cheese and set off to find a picnic spot. We had planned on climbing the Bell Tower of Clerigos Church and thought it best to do that before our picnic. To be honest it wasn't really worth the climb or the €5 entry because it was so packed with tourists. The narrow staircase of 200 steps was a chore with so many people trying to squeeze past each other. There are fabulous views from the top though, so it would be well worth it in the off season with less people. After that it was time for our lunch in the park. We wandered to Jardim da Cordoaira, a green and shaded beauty spot in the middle of the city. There are plenty of park benches and a little cart selling freshly squeezed lemonade to quench your thirst. Finding a bench near the brilliant Juan Muñoz sculptures, we savoured the variety of cheeses and port we bought in the shop. It's a lovely alternative to having your lunch in a cafe or restaurant, especially on a beautiful sunny day. Neil was determined to get some timelapse video from across the river so we had a mission! We crossed the bridge and found a spot to chill out by the riverside while Neil happily set up his shots. Anywhere along here is perfect for a picnic. The views across to Ribeiro, along with the lovely breeze, and the bobbing rabelo boats implore you to sit and linger for an afternoon. The final timelapse was put to good use in the video here. We had planned on catching the cable car up to Jardim do Morro but we missed the last one. The walk up was tough, really tough! It’s very steep and very long, especially after a couple of beers but sunset up here is well worth all the sweating. It’s level with the top of the bridge and has a lovely, grassy picnic area. There’s a really good atmosphere with lots of people enjoying a few bring-your-own drinks and probably the best views you can get of the city. If you have the legs to climb higher, head for Miradouro da Serra do Pilar which is on top of the huge convent beside the park. This was one of Neil’s favourite places for sunset photos and we climbed up again for another sunset the following day. All that walking made us hungry so we went back towards our neighbourhood to see if we could get into the cafe that was so busy the first night we arrived. Well, we can absolutely say, without a doubt, its popularity is well deserved. Never in our lives have we had sandwiches like these. Roasted pork, falling off the bone, melty Portuguese cheese all slathered onto a floury bap...oh my god, I’m drooling thinking of it even now! It’s a great spot, clearly a local favourite and is now becoming increasingly popular with visitors. Late at night is probably the best option if you don’t want to queue down the street. Even if you don’t try the sandwiches, go to Casa Guedes just to witness this family work their magic, like they’ve done for generations. Oh and of course giant tankards of Super Bock! Our last day in Porto, we made sure, was going to be a busy day of discovery, food and port! We set out, first of all, to find a really decent cup of coffee made with real milk, not UHT! Not far from our apartment was Combi Coffee and it hit the spot. Lovely flat whites, gorgeous freshly made pastries and Açaí bowls. It’s definitely worth a detour to get a decent and healthy breakfast with proper coffee! There’s WiFi and really comfy seats so it’s great if you need to catch up on work or simply people-watch out the wide open entrance. From here, it was an easy walk to Sé do Porto. You can’t miss this huge medieval Cathedral with Gothic and Romanesque architecture. It’s built like a fortress and the view from the square is magnificent, although this is where criminals were hanged for all to see. Sao Bento train station is only a couple of minutes walk away. You might pass it easily by like any other train station but step inside the hall for a spectacular display of those lovely blue and white azulejo tiles that depict battle scenes and everyday life in Portugal. It’s certainly the most beautiful train station we’ve been inside (so far) but again it’s a bit of a battle of the selfie sticks when it’s busy. We continued heading North, wandering down random streets and just enjoyed finding hidden gems along the way. We came across Conversas Vadias on our wanderings and because we love Japanese food we were delighted with this happy accident! It’s a kind of fusion of Japanese and Portuguese tapas. They're only small dishes, a little bit pricey but really tasty. Do come here to experience the Iberian pork goyza and their selection of vinho verde (a refreshing, slightly fizzy, white wine). At least once, get the ferry from Ribeiro over to Vila Nova de Gaia. It’s only a few minutes across the water but the cool breeze off the river provides a welcome relief on a hot day. It’s especially nice if you’ve already done a lot of walking around the city and you need to get over to the port warehouses for a tour. We had decided to take the tour in Cockburn’s Port Lodge and it was excellent. Neil had been to Graham’s before and, although the view from the lodge is outstanding, he said the tour in Cockburn’s was miles better. We recommend you splash out on the more expensive tastings as you’re given a VIP room and extra special reserves to try. This was certainly one of our highlights of our trip. It’s the only Port Lodge that still has a working cooperage and the staff are passionate and knowledgeable. If it’s roasting hot outside it’s the best way to escape the midday sun and learn about the fascinating history of port wine in the cool cellars. We actually caught the cable car this time to get up to our miradouro for the sunset. I’m not a huge fan of heights so, to me, this was like a thrilling ride in an amusement park with the added bonus of skipping an exhausting trek uphill! Our final sunset in Porto was as if the city had saved the best for last, especially for us. We lingered well into the blue hour and watched the lights from the bridge and along the riverfront, sparkle on the water. It was all very romantic! To top off our wonderful 4 days in Porto, we splurged on a gorgeous meal in Tascö. Traditional Portuguese petiscos (big tapas!) like smokey alheira (Portuguese sausage), paired with sumptuous wines (the staff here know exactly which one is for you!) and mouth-watering desserts, this place is not to be missed. Treat yourself here on of your evenings out and you can keep eating right up until midnight! It’s popular so check ahead for reservations. If you’re looking for a romantic getaway, Porto is the perfect city to take those leisurely strolls, drink fine wine and admire spectacular sunsets with someone you love. 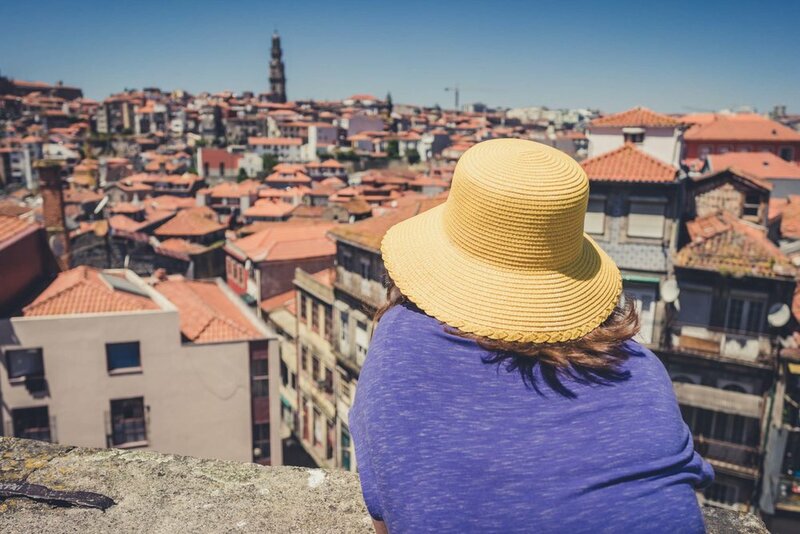 Have the best 4 days in Porto by taking it slow, stop and admire the views and follow your feet. Even with 2 days, don’t try to rush it. It’s one of those cities that is meant to be savoured. Let us know if you go and please share your comments below!